How to Recover Data from Water Damaged iPhone 6S Plus/6S/6 Plus/6/5S/5C/5/4S/3GS? Things you will need: Rice and hair drier. Situation 1: Dropped your iPhone into clean water. Pull the battery, and do not turn the device on. Forcibly flung it until the water inside of the device is dry off. If conditions permit, you can encase the wet iPhone with a thick towel, put it into the washing machine or dryer, which is full of clothes, for dehydration. After that, blow the iPhone with hair drier's cold wind, and then put it under the desk lamp or some mild temperature for continuous air dry, half a day is enough. After removing the battery and memory card, you can put the water damaged iPhone into a bag of rice to dry it. Take it out after a day. Pull the battery and wash the iPhone with still water directly. Open the phone, clean it with alcohol and use some soft brush to clean the flash chip pins and gaps. Finally, blow the iPhone with hair drier's cold wind. However, I suggest it is better to take the water damaged iPhone to cell phone repair shop. After all, they have professional equipment to deal with this kind of problem. When your iPhone gets dry, you can try to turn it on and check the data on the device. If unfortunately your iPhone can not be connected to the computer, you can recover lost iPhone data from its iTunes backup; if the water damaged iPhone can be opened normally, the first thing you should do is checking all data on your iPhone to see whether data is safe on it. You may find few data is lost, then, you can restore data on the water damaged iPhone directly. * How to Recover Data from A Stolen iPhone? * How to Recover Deleted Photos from iPhone? No matter what is your situation and whether you need to recover from iTunes backup or iPhone, you can rely on the 2-in-1 solution Coolmuster iOSRescuer (Windows Version & Mac Version), which is a tailor-made application that is fully capable of recovering data like contacts, text messages, call history, videos, photos, notes, calendar, Safari bookmarks and more from water damaged iPhone. It can find and copy your data by extracting iTunes backup file or directly scanning your iPhone. It supports not only iPhone 6S Plus/6S/6 Plus/6/5S/5C/5/4S/3GS, but also iPad and iPod. After you install the iPhone Data Recovery on your PC or Mac computer, run it and select the tab of "Recover from iOS Device". 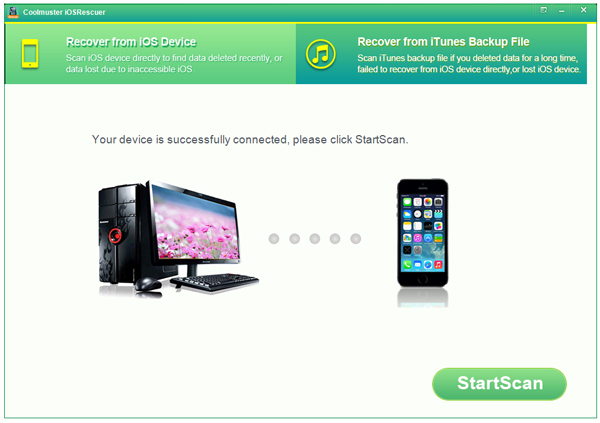 Press "StartScan" to let the program scan your iPhone. After the scan, all found data on your iPhone will be displayed in categories. 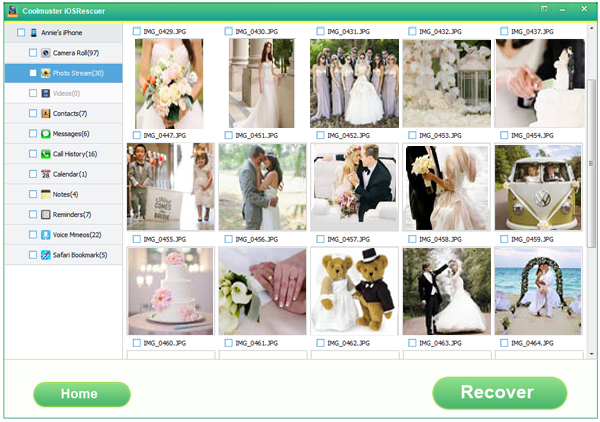 Preview them one by one and choose the data you want to recover. Finally, hit on the "Recover" button to save them on your computer. 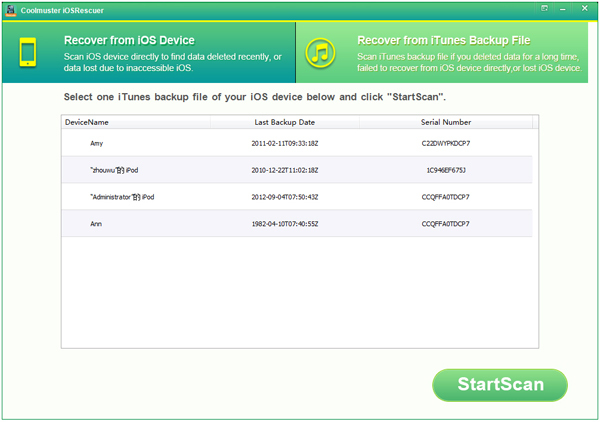 Choose the tab of "Recover from iTunes Backup File" after launching the Coolmuster iOSRescuer. You can see all iTunes backup records on your computer are shown here. Choose the one for your iPhone and click on the "StartScan" button. Preview the scanned out backup files for your iPhone, select those you want to recover and perform the data recovery for your water damaged iPhone by clicking on the "Recover" button. Choose any one of the above two recovery options according to your own situation. Only with Coolmuster iOSRescuer at hand, you can drive your panic and worry away! We kindly suggest you backup your iPhone data to iTunes from time to time, in order to better protect your personal data.